I saw that Pablo had retweeted a link about Lucas Film. It turns out they’ve just set up their own You Tube account with three videos spreading positive vibes about the company. Using folks who work behind the scenes from way back from ANH to porgs some of the VR and games branches. There hasn’t been many views considering and I noted comments had been disabled (ummm) . I’m not entirely sure why they’re doing this at this particular point - to show a united front and they care about their art? @MrsWindu And JJ just got a Twitter a couple weeks ago. Some people are just a little later to the social media show. @snufkin wrote: Hmm, consoling and nurturing each other. Sure sounds like enemies to me! Absolutely. It's how kids show their hatred and disdain nowadays. Ha that reminds me, didn’t you have a bet with a friend over TLJ and how this specific relationship would turn out? Oh yeah, a mate, who was a die hard Rey Skywalker, bet that their was no way Reylo could be a thing. I of course said Rey Skywalker couldn't happen because the whole trilogy is powered by Reylo. So I bet him if Rey wasn't revealed to be a Skywalker, in any way shape or form he would treat me to Taco Bell after the movie. After we saw it he was so enamoured by the concept of Reylo, mainly because of the Praetorian guard battle, he was all in for the pairing. While eating he said defeat never tasted so good. And surprise surprise his favorite scenes from Last Jedi are all the Ben and Rey ones. @Darth Dementor I hope that story gets you a deal with Taco Bell as part of the promotional blitz for IX, "the Dark Side never tasted so good!" And your example is a great anecdote about how real people, not diehard obsessive fans who congregate on the Internet, reacted to the movie and saw what was happening. @californiagirl wrote: @MrsWindu And JJ just got a Twitter a couple weeks ago. Some people are just a little later to the social media show. @californiagirl Actually, JJ's had that twitter account for a long time. I saw it last year. He just never posted anything public in it until recently. Oh I know, I just didn't phrase that correctly. It even says joined October 2017 on his page. Just for all intents and purposes, it was a locked private account until filming. I wouldn't be surprised if JJ becomes more active interacting with others as we get closer to IX. @Dar-ren19 I hope someone, almost anyone at this point, gives a couple little hints and glimpses. Because after the first week or so of filming, all the cast and crew suddenly went pretty quiet. I wasn't around here or paying attention to spoilers when TLJ was in production. Was it any more active in terms of social media? Poe, when taking out the dreadnoughts, CLICKS off his communication to Leia, does his own thang as really wants to take out that last dreadnought, without thought on cause and effect. Finn, when on Crait, wants to pull a kamikaze of sorts to sacrifice himself for, in his own thoughts, the greater good of the remaining resistance clan, CLICKS off communication with Poe/Resistance, plans get thwarted as Rose sacrifices herself in an act of love, according to her, hence the message of save the ones you love, etc. Rey and Ben, realise that their force connection is still in play at the end of it all, both bewildered with all the action that took place on Crait, Ben wanting to maintain his connection with Rey, almost a regret and plea written all over his face, but Rey CLICKS off the communication with Ben. I find the pattern of interest and would love to hear anything thoughts folks might have on this. @Starliteprism Great catch! It took a couple viewings and reading one review for me to pick up on the connection theme, which starts with the whole "holding for General Hugs" gag which foreshadows that Snoke is actually pulling a larger one on the Resistance by boosting the Force Bond between Rey and Ben. @snufkin wrote: @Starliteprism Great catch! It took a couple viewings and reading one review for me to pick up on the connection theme, which starts with the whole "holding for General Hugs" gag which foreshadows that Snoke is actually pulling a larger one on the Resistance by boosting the Force Bond between Rey and Ben. Wow. I wonder if you could include DJ's tactics(as things like to layer in 3s), as he was playing it one way, but then got into communication with the First Order to cover his back and although not force connection themed, there was a ton of things that all then headed all at once; Finn and Rose almost getting decapitated, Rey and Ben fighting over the lightsaber and breaking, Holdo going through the Supremacy and slicing that, not exactly in half, but close, but then Holdo's move helped prevent the deaths of Finn and Rose, along with buying time for the resistance, etc. It kinda makes me wonder if the Cosmic force and living force was having a major conflict at that point and things really could have gone the opposite way, like if Rey chose to go with Ben, would trajectory change, Ben call off the attack, Holdo not having to put the Raddus into hyperdrive, Resistance get away for the day, Luke not having to sacrifice himself, etc. I have another thought to share, but need sleep and will do that some point tomorrow. @Starliteprism A little of that probably in terms of Force being in play around the characters and depending on chance. Like the spinning saber landing at Kylo's feet when he realizes that he can kill Snoke. He could've easily chosen to kill her the same way he felt he had no choice in killing Han because he was no match for Snoke's brute strength. And "the Force wills it" to borrow one of Chirrut's line is how I figured everything aligned on Jakku at the start of TFA. Kind of like how in the original movie, Leia sends off R2 to Tatooine and ultimately her long-lost step-uncle buys the droid and her long-lost twin brother comes to her rescue. With DJ, maybe a little. He seems like he's there in part to subvert expectations people have from characters like Lando and Han. He's a scoundrel (even responds "Sorry I turned out to be exactly who I told you I was" when Rose yells at him in a deleted scene) who doesn't have a heart of gold and like Kylo takes an opening when he sees how to get out of a bad situation. Though my guess is that DJ dies on the Supremacy thanks to Holdo's kamikaze maneuver. He's also there to play Devil's Advocate for Finn in terms of running away/looking out only for yourself versus Rose's example of taking a stand and fighting back. Even if it's BdT playing the role, it's such a stock character you'd have in children's stories. Hi all, sharing something I came across that is new to me.. and I found adorable! 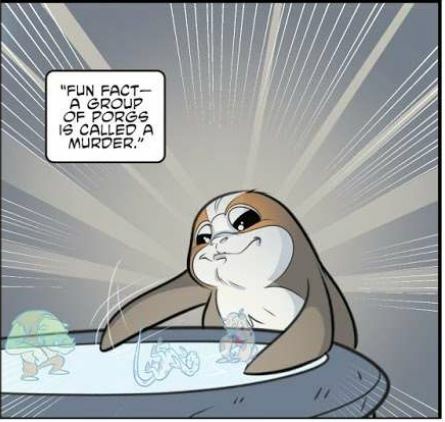 It seems Rian Johnson's wisecrack about how a group of porgs is called 'murder'- has been brought into canon! There's a whole story about the porgs sneaking on the MF and stealing things and confusing Rey and Chewie. If you love porgs and haven't seen this yet, I'd highly recommend it. 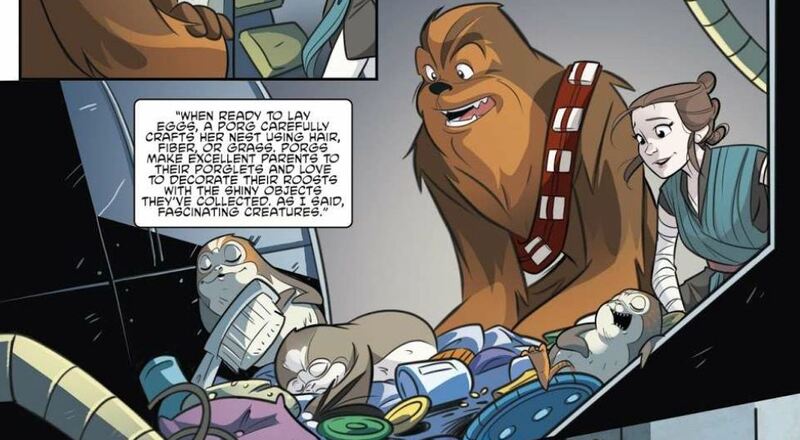 The porgs steal lots of things and hoard them all in a little corner somewhere on the MF. Here it is because well.. it's adorable! C-3PO: Excuse me sir. Might I have a word with you, please? Han: What do you want? C-3PO: Well, it's Princess Leia, sir, she's been trying to get you on the communicator. Han: I turned it off, I don't wanna listen to her! I think there’s an element of that when Rey severs the connection and slams the door on Ben’s face. I really wonder in IX if Kylo is going to play things off as being "too cool" now and not try to contact Rey in the face of his humiliation... or if he'll be trying to contact her, and she'll be ignoring him. I think he'll leave her alone, personally. He opened his heart to her, making his first human connection in forever and fell in love with her. That was a huge deal for him. The rejection stung big time and set off his big meltdown on Crait. He was in full spurned lover mode. But then the final scene he seems to be searching Rey's face for compassion/a change in heart and has a look of resignation when she slams the door. He accepts that it's over (from his POV). He's obviously heartbroken about it but he doesn't believe he has a chance any more with her so I don't think he'll try to go after her. It's a different dynamic than the end of TFA now. They got to form an intimate connection with each other and Rey seemed to reciprocate his affections (unlike TFA) so he grew hopeful. I think he'll be wary of her and maybe a bit hostile while Rey will be the one who's more quiet, softer etc. when they meet again. Projecting my own experience, in my single days, when I'd get dumped, I'd also do everything that I could to avoid the person who dumped me. Granted, I might internet-stalk them to see what they're up to, if they're dating anyone, etc, but I was more of a tail-between-my-legs dumpee, who didn't try to contact the person (even if I got the dreaded "let's still be friends" line). I kinda see Ben being the same way--especially, as you put it, with that look of resignation that he had on his face when she slammed the door. Although I guess the Force itself is still a bit of a wildcard, even if neither of them is trying to contact the other--the Force might have other plans about that. Agreed. The Force kind of acts like a neutral arbiter and matchmaker with these two. So even if they don't reach out to each other again (because they're both too hurt), the Force will probably have different ideas. Either that or some event in the plot will force Rey's hand. Either of those scenarios is most likely, IMO. But I don't think Kylo will try to connect with her again. There's also the popular headcanon that Kylo will send the KoR after her because he vowed to destroy her and the Resistance, but again, that's ignoring their final scene together. I suppose he could become obsessed with finding her and use the KoR as an excuse, but I don't like the idea of obsessed Renperor. It's a common theme in fanfics but I'd rather JJ not go down that route. The other option gives Kylo more agency as a character (especially when he should have that now as his own man and the final chapter should bring about more maturity), and is a better set up for romance, IMO. It's also more angsty. If I were JJ I would use the chance to play up the angst to maximum levels. I'm pretty sure that IX will about how the connection isn't broken, just like what I noticed today in ESB. Rey's angry and fed up with Ben like how Kasdan has a line in the script when Han and Leia are fighting on Hoth about how "he's had it with this broad" because she's bullshitting him. Rey turned off her connection with Ben the same way - she's so angry and fed up that she doesn't want to listen to him. It's the "He's sleeping on the couch" joke. But something will happen to re-open their connection. I remember one of the interviews after TLJ where Rian talked about having the idea that their connection would be like Vader and Luke's in the final scenes of ESB. He outright lifted one of the profile shots of Vader from that segment for when Ben's waiting for her to arrive at the Supremacy. We know Kasdan's still around and he wrote all of that. It probably won't be as overt as the deleted scene for Luke's introduction in RotJ where Vader is calling to him like "Helllllo? Helllloo? Luke are you home? This is your father speaking." I do think that he knows she's blocked him on Spacebook but trying to keep tabs on her somehow. The whole kicker in ESB about "No, I am your father" is that all of the probes sent out at the start of the movie have nothing to do with the Rebels and Empire and everything to do with Vader's "personal interests." My best guess is that we'll see something like that in IX. Rey's a high profile target for the FO where Kylo's trying to keep a step ahead of Hux and it's a trap meant to ultimately ensnare and take out the two of them. In terms of romantic angst, besides the flash of recognition I had watching that scene, I'd guess we'll get something along the lines of "We both went back to what we were good at doing" and "No matter how much we fought, I always hated seeing you leave"/"That's why I did it, because I knew that you'd miss me." I don't think he'll be obsessive Renperor, he's been humbled by her rejection and his actions on Crait so he'll be keeping a distance, maintaining the facade of "the villain he thinks he's supposed to be" while internally licking his wounds and pining for her. Maybe IX will have some parallel to this exchange, but who in what role? has elements both of that scene, "Who are you?" "Somebody who loves you" and "For once, let me see you with my own eyes." But it'll be interesting to see what else gets quoted in IX and if that particular reunion gets referenced when their paths cross for the first time since the Force breakup. I also think that the end of TLJ, plus the inevitable time gap, indicates we will get sad, dejected Kylo in IX. It's the same reason I'm sort of wary of another Rey-Kylo fight. When we need Kylo to save the galaxy and the force and possibly marry Rey in the span of one movie, there's not really much leeway to keep having Kylo be obsessive and at least semi-violent. The end of act 2, TLJ, is rock bottom. A good chunk of the audience think Kylo is done for. Some more vocal observers extrapolate even more about him being galactic dictator. Kylo needs everything he can get to endear the audience to him. The only direction to go is up. To just keep having him make bad decisions into the last act doesn't really make sense. He needs to be or become as selfless and humbled as possible, or he won't have learned much of anything over the course of his journey, so what is his arc? It isn't just about getting the girl, the viewer needs to be happy that he will live happily ever after, re: he needs to actually deserve the ending, a la redemption. So just having him be an aggressive weirdo at this late stage seems counterproductive. how would you have written tlj if kylo was actually supposed to be a manipulative figure using rey for power and a coup, and the lesson was supposed to be that she not trust him anymore and accept that she has to defeat him? what would that movie have looked like, if the antis' reading actually took place on the screen? I’d have Kylo walk towards the throne—and not Rey—at the end of the praetorian guard fight. additionally: give him some monologue revealing his intent, maybe a proper villain monologue when he *proposes* to rey (”did you really think I cared about you? You matter to me as a means to an end, you worthless sand rat. I’m offering you more than you deserve, a chance to change your life, a chance at POWER! Join me, and you’ll never know hunger or sickness again. Refuse my offer and I’ll destroy you!”) which in this version probably happens when he’s already on the throne and physically distant from her, have some scene when he’s alone and smirking or something, maybe have a scene or two at the beginning where Snoke inadvertently gives him the idea of using Rey to get rid of him, significantly alter all the scenes where he looks visibly emotional in Rey’s presence to make it clear that he’s faking emotion (adam is an excellent actor and he would do it brilliantly), have him attack Crait in a perfectly cold and calculating manner and not in the middle of an emotional meltdown, absolutely cut the last force bond scene, (the hut scene can stay but only rey’s emotions are shown and if it cuts to kylo’s face it’s only to show that he’s cold af and moderately satisfied that everything is proceeding as he has foreseen), etc. These movies, while not “specifically” made for kids, are meant to be accessible to a very young and not genre-savvy audience, who doesn’t look for clues and doesn’t spend ten hours a day discussing obscure fan theories on the web. So if Kylo is a manipulator and Rey learns her lesson in the end, it should be clearly telegraphed that he was manipulating her, and that she understood she was being manipulated." Kinda belated, but I think I finally put a finger on why Poe's arc in TLJ doesn't quite work for me. - The main lesson Poe learns in the film is that a good leader cares about more than bold heroics and blowing sith up. The lesson is emphasised by Leia's remark to Poe that Holdo cared more about saving lives than being a hero (paraphrasing). That Poe learned the lesson is demonstrated on Crait when he recognises that the main priority of the Resistance is to survive, rather than join Luke in his heroic last stand against the FO. - The problem is, the moral of the Poe/Holdo conflict which takes up the bulk of Poe's arc to me seems about something else entirely, something like "you should respect the chain of command and trust your leader's judgement", or "don't judge the book by its cover". Holdo doesn't trust Poe because he's a hothead, but their conflict does not really revolve around their contrasting approaches. It's about Holdo believing that Poe should simply follow her orders, and Poe refusing to fall into line. Plus the movie seems to hint that Holdo is not what Poe expected, and therefore he considers her with a bias (unlike some I don't think it's the fact that she's a woman, it's more about her rather unmilitary appearance and pink hair). - There's no point in the film when Poe is confronted with the fact that his high-risk derring-do plan was a bad idea. Meanwhile, once he learns what Holdo's more cautious plan actually is, he's instantly onboard with it and there's no reason to think that he wouldn't have accepted it if he heard it at the start of the film. So there's no real sense that Poe got to reassess his hothead approach to things, and the movie kinda shows that in fact he's totally fine with more cautious and sensible tactics. - Overall, I think the movie tried to play it too clever for its own good and should have taken a far more straightforward approach to Poe's arc, rather than playing with the reversal of expectations and keeping the audience guessing etc. etc. TBH, I actually felt sorry for Poe when he begged Holdo to give him and the Resistance some hope - her remaining tight lipped was what led to his ill fated mutiny. I'm still puzzled why she never told him her plans. For all his faults Poe was devoted to the Resistance and completely trustworthy. I also disliked her rather insulting dismissal of Finn and Rose.